From right to left: Mason Metals' Pete Lowe, Neil Woodall, Natasha Millard and Jenny Long of IceBlue. Chi Onwurah MP, the Shadow Cabinet Office Minister, saw how cutting-edge digital technology is aiding traditional industry when she visited Mason Metals Ltd.
Chi, who has a digital brief, was a guest speaker at The Greater Birmingham Digital Summit at the ICC, which offered small-medium enterprises the chance to learn about the benefits of digital technologies and skills. She was then able to see a great example of small Black Country businesses working together to bring a traditional industry into the 21st century at Mason Metals, Two Woods Lane. 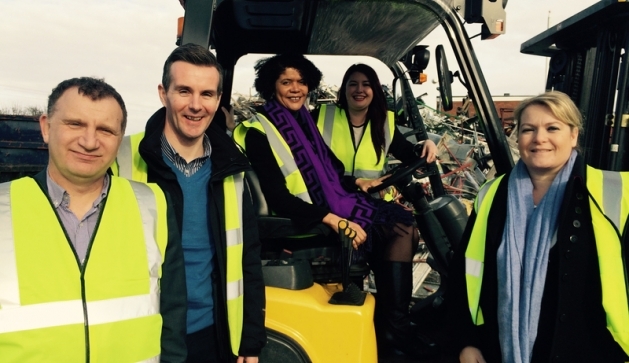 Chi was joined by two Labour Parliamentary candidates – Natasha Millward (Dudley South) and Pete Lowe (Stourbridge) – in hearing how Cradley Heath-based IT & marketing consultancy, IceBlue, had revolutionised the scrap metal operation with cloud-based software. Four years ago, IceBlue was asked by Mason Metals to provide transactional software to solve challenges that would be created by new legislation, which required all firms to properly account and receipt purchases to prevent stolen metal being sold on for scrap. In a joint venture, IceBlue devised a new MetalTrack system which has enabled Mason Metals to become paperless. The system has proved so successful that it has been rolled out nationally to other scrap metal merchants. It has now processed more than 350,000 transactions, equating to £70million worth of scrap metal purchased through the system. Paul Long, Director of MetalTrack, said, “The challenge was an industry-wide one so Mason Metals’ problem was faced by every metal merchant across the country. From the outset, we opted for a cloud-based solution so we could make the product national. We joint ventured with Mason Metals and built a system which met their requirements.” MetalTrack creates a Waste Transfer Note, securely scans and holds customers’ personal ID and syncs with the merchant’s bank to provide electronic payments. In Mason Metals’ case, this is a same-day Bacs transfer. This sensitive data is held by IceBlue in state-of-the-art, government-level servers which will soon be kite- marked by a forthcoming IT industry standard.